Very interesting material. It would be nice to see a picture of Viola as an adult. I knew Viola in her last 4 years and celebrated her last 4 birthdays with her. We never talked about her case but I was a cop and very interested. I’ve collected a few things over the years and would be interested in seeing what other people have of the most famous murders in Calhoun County. Having done my family’s family tree, I am interested to find out if Viola also shared my family tree? Most likely, she is in my tree at some point. Would like to hear from others who have the family name of Hyatt in their tree. Best wishes on researching your family tree. It can be fun to find an occasional notorious person roosting there. I can’t help you with the ancestry since my story about Viola Hyatt is meant only to keep the tale alive and to be an interesting read for those who like such things. There is a tremendous amount of interest in Viola. I posted the story on Scribd.com and it has gotten hundreds of reads–far more than anything else I have written. That’s interesting to be able to claim such a notorious person among kinfolk. All families have their share of questionable kin. Viola’s father married my great-aunt Jessie to have someone to watch after Viola, although he would not support nor allow Aunt Jessie to discipline Viola. We visited the Hyatt home between the time she killed the men and her arrest. I was four years old, and hyper, so she took me outside for a walk, and to the “trailer,” where she told me that she would be right back. She went inside and brought out a teddy bear. She gave the bear to me, stating that her boyfriend gave it to her, but they broke up, so she didn’t want it any longer. I liked Viola, and remembered her wearing red lipstick. Red lipstick and such drew my attention, because I wanted to be fashionable when I grew up. I believe she was wearing dark blue overalls and a white shirt, but also red lipstick. The Cynic Online Magzine has picked “The Scattering,” my story about Viola Hyatt and it is scheduled to appear in the October 16th issue. At Scribd.com the story has well over 1,500 reads so there is still a good bit of interest in the famous case. I thought some of you might be interested. Is the writing you published on Scribd.com titled “The Scattering”? I have searched for it, and saw many of your writings, but was not able to find the writing about Viola. Any ideas or hints on locating it would be appreciated. Thank you. Elton, I was able to find your story on Viola, on Scribd.com. I read it, and find it fascinating. Most of what I have heard over the years came from family members, and I have been able to recall some details of the day we visited Aunt Jessie, and Viola was there, between the murders and the arrest. Two things that I remember…the bright red lipstick (too much), was just as you wrote it. And the the places on the “trailer” where the shotgun marred the surface. She very quickly slipped inside, telling me to wait outside, because it was a “big mess” in the “trailer.” The structure, as I recall it, looked more like a shed than a trailer. I wish you multiples times multiples of readers. Not only are older folks interested in Viola, but so are the younger ones who have heard parents and friends talk about her. 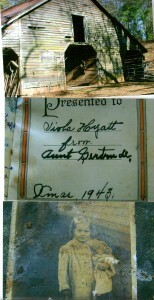 Virginia Viola Hyatt is related to me somewhere in the family tree to my great grandfather. know one in my famil claims to know anything about her. If anyone has any info please post it i want to know more! Viola is my 1st cousin 1x removed by her mother, Virgie Laura Robertson. The “Aunt Gertrude” in the gift bible is the wife of my grand uncle, Grover Cleveland Robertson (We say “great uncle”). 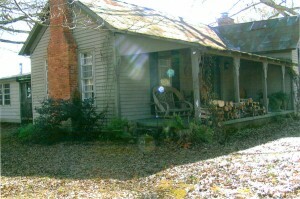 Our family research hits a dead end with him and his grandfather, Silas F Robertson. If anyone knows about him and his ancestors, please let me know. It’s interesting to hear from relatives of the two men who were murdered. I avoided using their real names in my story in the event that they had living children or grandchildren, but of course the names are readily available on the Internet. It’s too bad that we can’t hear their version of events leading up to their deaths. I imagine there was plenty of “blame” on both sides. My mom and dad used to visit with Viola on Thanksgivings before she died. I met her when I was 2 years old. I didn’t know the story of what happened when I was that young but I found out when I was delivering food to her one Thanksgiving. She was such a sweet lady when I met her. I was there at the farm a couple of days after the murders. I was 7 at the time. My Grandmother lived nearby. Wow, rather gory place for a kid to be visiting, but there was a lot of interest in the horrible crime and the interest continues down to the present. How sad that Viola didn’t supply us with details after her release from prison. my dad took me over there the day it happened! his name was Travis Cheatwood and i was 9 years old…my name is Dennis Cheatwood from White Plains! had a brother named Butch…thats all i remember is pulling up in the drive way in our black ford truck.. I remember the murders and all the tales that were spun from this event. Many years later, I work for the telephone company. 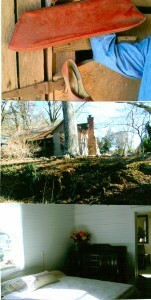 The phone lines were behind their farm house in the woods. Often we had to get access to the woods by driving thru a farm road next to the house. Phones line problems were often in that area, and the Hyatts had phone troubles as well. I got to know Viola through working on their phone line. Viola was a sweet lady. Often offering me a coke on hot summer days. No one has mentioned that Viola was mentally a simple person. I am not sure how to describe it, but her mental capacity was not up to full scale. She did not exhibit the ability to commit the gruesome murders. Perhaps if she were defending her Father, she could have done the murders. But someone else did the butchering and scattering of the bodies. She could have helped, I don’t know. But from by observations –she did not know how to drive. Didn’t have a drivers license. I don’t have any proof of any of this, but I dislike all the sensationalized accusations about Viola, whom from what I have known was a victim of circumstances. She was a nice lady and I think authorities at the Tutwiller prison could also vouch for that statement as well. I had heard the story so many times and I began dating a man from White Plains area… Never asked him about it. Recently I was speaking to My fiancé’s mother and she was telling me the story…. Then She said it…. “Viola was a relative of ours”. I have been thinking how small the world really is now! I lived in Gadsden and did a research paper on this murder back in 1974 or 1975. I worked at the Gadsden Times and had access to the microfiche room and read all the articles about this case. I also interviewed several people at the court house that remember the trial and there are photos of her following her arrest. Following her arrest, she took the sheriff and retraced that deadly drive as she dumped the body parts throughout 3 different counties. Panic gripped the entire area with fear until she was arrested and confessed to these two horrific murders. I was told that after she dumped their bodies on Saturday night she went back to White Plaines to an all day church singing on Sunday morning! Very interesting! Elton…thanks for your information, very interesting writings! I’ll see if I can find my research paper! For much of her time in prison, I understand she worked in the wardens home as a maid. Folks around White Plains were amazed. My mother visited her often in her last. years. The Alabama state trooper who arrested her and got the confession from her a very few years latter became a major and ran the Alabama I & I. Majro w. Jones. This was a very strange story. My Mom grew up in White Plains and I remember us having a discussion about Viola. She distinctly remembers seeing Viola walking down White Plains Road in front of my Mom’s parent’s house with a shotgun tucked under her arm. She said that Viola walked with a bit of a swagger, one that seemed to be an unspoken dare for someone to cross her. She recalled hearing of Viola going to Easom Hill, GA on at lease one occasion to look for young men to fight. Easom Hill, at that time, was one of those state line towns that attracted a rough crowd. As to the sexual abuse, something an attorney friend of mine quizzed my Mom about after he heard that she knew of Viola. My Mom said that Viola’s parents were normal parents and known as good people in that small community. What happened with Viola was a mystery as Viola seemed to be the antithesis of all that her parents stood for. My Mom said that if there was any abuse involved, it would have been Viola towards her parents rather than the other way around. Apparently White Plains was a bit of a Peyton Place at the time and the story of the murder just added fuel to the fire. In My Mom’s opinion, Viola was just one of those people you hopped to never run across in life. My Great Aunt, is long dead now, but she remembered Viola coming to her house for dinner, basically unannounced, at least a couple of times. They were afraid to turn her down, so they dined with her, although reluctantly. Viola was sure no Saint and how she escaped the Electric Chair escapes me to this day. Lee & Emmett were my great-uncles ,my grandfathers brothers .I did not know them , I am way too young , however the story is very interesting to me. 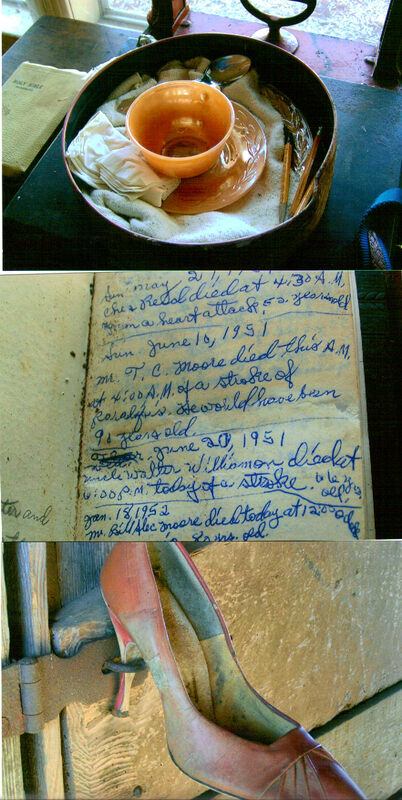 Recording the death dates of relatives in the family Bible is not a fascination of death. In the south in the past, recording birth dates and death dates in the family Bible was common. My Grandmother’s family did it and we still have the Bible. Her step mother was so terrified of her she died the morning Viola was released that afternoon. I still say something was hidden in that family. Lee and Emmet Harper were my great uncles. Brothers to my grandfather. At 5 years old I overheard my grandmother and family talking about the murders as a magazine had published a story about the murders and Viola Hyatt. They were looking at the magazine a “True Crime” magazine as I recall. I heard the brothers were heavy drinkers and there probably was a fight and she had revenge on her mind. My grandfather was killed in a car accident in 1949. Very sad for my great grandparents to lose three sons tragically. Lee and Emmet were also my great uncles..My grandfather was Omar Fred Harper. My dad is oldest of Velma and Dan Harper. Fred, Joe, Lee, Emmett are the uncles( brothers) my dad talked about. Are you still living down in Andalusia area? We are visiting in a couple weeks family. Maybe you can come to reunion meeting. She was my grandmother’s cousin. My grandmother refused to talk about Viola until a decade or so ago as she was always embarrassed about the publicity. My sister and I have been trying to learn more about Viola. Thank you for the information. A new book has been published that is far more detailed and accurate than my partly fictionalized short story about Viola. The title is “Mr. X and Mr. Y.” It’s available at reasonable cost from amazon.com Write me at elton4562@yahoo.com for more details if you wish. Interesting that there was a play done at JSU about the Viola Hyatt story. I’m surprised there hasn’t been a movie. Or has there, and I just don’t know it? I haven’t thought of this story in so long, I can’t recall where Viota Hyatt was buried. If her guilt was questioned, it would be most interesting to see how forensic science would handle it today. To AWB: Rabbittown Missionary Baptist Church Cemetery is located 2.5 miles from the junction of Alabama HWY 9 and Calhoun County Road 55. The Cemetery traces its antecedents back to the 1840’s. It is found at T14S R9E Sec13. Your story contains a major error in the first paragraph. White Plains has never been known as Rabittown. The two are separate communities with several miles in between. I lived in White Plains when this incident took place and recall the crude excitement of fellow students who for awhile mocked “Viola” in the manner that youngsters pretended to be Frankenstein when they wanted to scare someone. But I recall the whole matter having a very brief effect on the community and don’t remember it being mentioned a few months later. The scuttlebutt in the community was that she was taking the blame for her Dad in the assumption that she would escape punishment or get off with a light sentence.